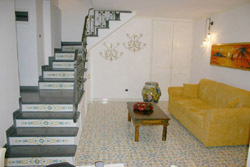 This refined accommodation is located along Via Pietà, in the heart of Sorrento. 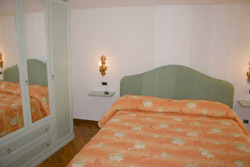 The proximity to Piazza Tasso and at the same time its quiet position makes this apartment ideal for its guests. In addition, this home is near the railway station and the port for an easy reach to the other resorts in the area. 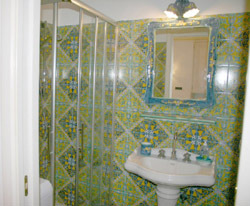 Casa Vilù is an elegant three-roomed apartment of 60 m2 with an independent entrance, sleeps 4, furnished with care and decorated with the precious Vietri ceramics and Venetian chandeliers. 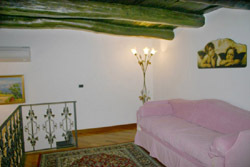 Ground Floor: Large living room with sofa-bed (for 2 people) and kitchen-corner, bathroom with shower. First Floor: Lounge with table and sofa, double bedroom, bathroom with only toilets. Ceramic tiles from Vietri on the ground floor and wooden beams to the ceilings and parquet on the first floor confer on this home a warm and at the same time a refined atmosphere. 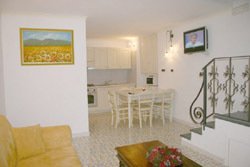 In addition Vilù apartment is equipped with all the comforts and the air conditioning. Air conditioning - TV Colour - Heating system – Washing-machine - Dishwasher - Microwave Oven - Toaster - Restaurants, shops and bars in the immediate vicinity - Train station and Post Office at 400 meters – Bus stop and Paying Parking, banks at 200 mt away – Paying Beach at 500 meters.